The Audi TT RS possesses many traits we’ve become familiar with in the current generation of fast Audis. It looks truly fantastic – all sharp angles and wide aggressive stance – it’s devastatingly quick, beautifully made inside, and has a characterful, monstrous five-cylinder engine. However, it’s also hobbled by the same flaws, with overly light steering and neutral handling that prevent it from knocking the Porsche Cayman off its perch as the best pound-for-pound sports car. By now, the Audi ‘RS’ treatment is a formula so familiar and predictable you could set your watch by it, but that takes nothing away from its effectiveness. The slim TT might not seem like the most appropriate canvas for grafting on wings, vents and spoilers, but the RS looks suitably aggressive in its standard guise. The most striking details that set it apart from the rest of the range include a fixed wing on the back of the boot, a much deeper chin spoiler with ‘Quattro’ lettering inset, and 19-inch alloy wheels (20s are an optional extra that do an even better job of filling the wide arches). Rather than the quad-exhausts of the TT S, the RS has just a pair of big bore oval pipes that fit flush with the fat rear bumper. The overall image is one of menace – this car looks like it means business – and that is helped by the RS exclusive colours, Nardo Grey and Ara Blue, both of which look fantastic. The TT might not have the natural sports car proportions of the scalpel-sharp Porsche 718 Cayman, but it doesn’t look like the poor relation either. It’s small but mighty. As the flagship of the range, the RS has to feel that bit nicer inside than any other TT. Luckily, the standard car already sets the benchmark for quality, ergonomics and technology in this class. The materials, and the fit and finish are gorgeous, and give the cabin just as much glamour as the exterior styling. It has a very high-tech feel as well, with digital air-con dials built into the vents, and a huge 12.3-inch display behind the steering wheel that shows all the infotainment menus as well as the regular instruments. It’s an extremely driver focused interior – the passenger has nothing to look at except the road ahead – but despite the cutting edge feel, it’s deceptively easy to use. The driving position is good (not quite as low as in some other rivals, but sporty nonetheless) and has plenty of adjustment. The RS comes with a set of extremely heavily-bolstered, figure-hugging Super Sports heated leather seats, soft Alcantara trim on the steering wheel and gear selector, lots of ‘RS’ badges, and the option to include dash inserts that match the exterior. For the ultimate ‘go faster’ interior you can also specific carbon fibre weave inlays to transform your TT RS into a real junior supercar, but it’s quite a pricey option. A sports coupe is never going to be the last word in practicality, and that’s certainly the case with the TT RS, but it’s actually fairly flexible for a car of this type. The compact rear seats are so tight on both head- and leg-room that only small children will fit, and even then, they’ll struggle to find any room to put their feet under the wide, wing-backed sports seats. You’re better off viewing your car as a two-seater, and folding down the rear chairs to extend the TT’s already very generous 305 litre boot (bigger than most superminis), to an even more generous 712 litres. The space is a usefully square shape, too, with a wide flat floor that means you can carry a pair of decently sized suitcases, even if it is rather shallow. Two-seat rivals such as the Porsche Cayman might not even give you the option to carry young children or change the size of the boot, but the Porsche has a trick up its sleeve. It has two boots: one at the front, and one at the back, helping you take as many soft bags or bits of shopping as you need. However, the Audi has a lot more cubbies and storage options inside, making it an easier car for long trips. 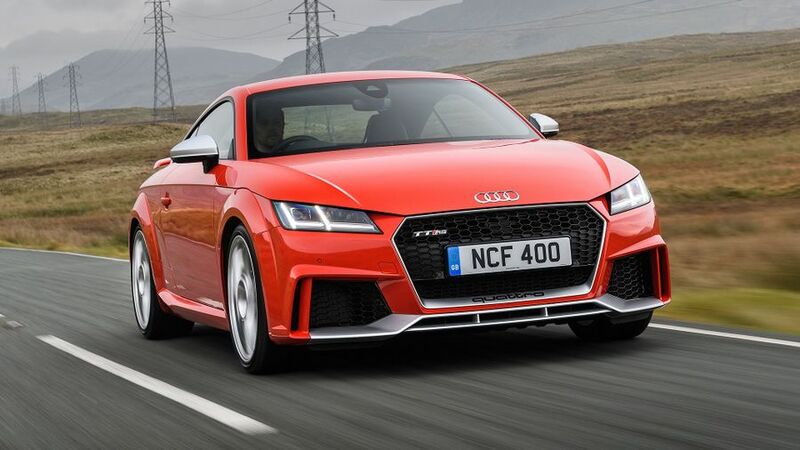 The last generation of Audi TT RS was infamous for its board-hard ride, but while the new model is still definitely on the firm side, it rides over bumps and dips with a lot more grace and suppleness than it used to. Even so, speed bumps and larger potholes will still send a jarring thud through the wheels and up into the cabin. Unlike the TT S, which has adaptive dampers as standard, it’s an option on the RS, and one that we would strongly recommend if you want to use it as a daily driver. It helps make the RS a softer town car, but tightens everything up nicely when you select the sportiest settings. We would also say it’s a must if you opt for the larger 20-inch alloy wheels. 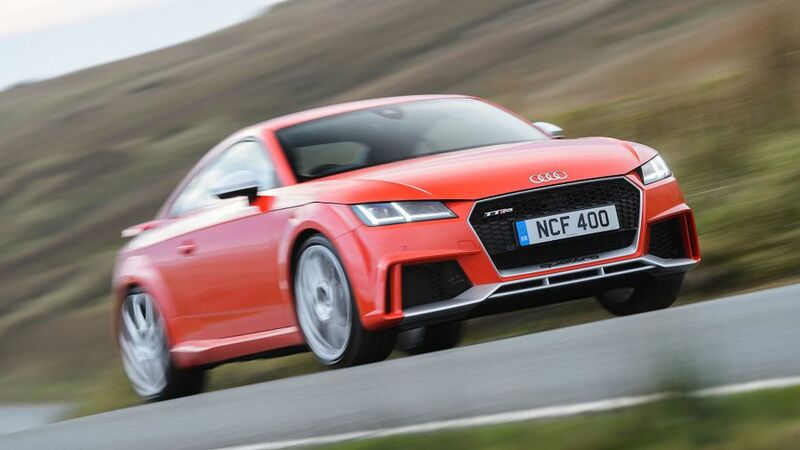 Thanks to a trick four-wheel drive system, and wide, sticky tyres, the TT RS has an enormous amount of grip. Tip it into a fast or tight corner and it’ll stay flat and composed, slingshot you out the other side, and let you get on the power straight away. There’s no wayward oversteer here regardless of conditions. If you want edgy rear-drive thrills then the BMW M2 or Ford Mustang are both a bit more entertaining, but neither will see which way the Audi went on a tricky road. It handles well, in other words, but the light steering and the grabby brakes lack the depth of feedback you get from the best sports cars, a small, but important point for the most enthusiastic and demanding drivers. Describing the engine in the TT RS without veering into exaggeration is no easy task. Its characterful 2.5-litre, five-cylinder turbocharged engine is what sets the RS apart from other TTs and, indeed, justifies its higher price. Producing 395bhp in a car that is this small means a 0-62mph sprint of 3.7 seconds, just a few tenths short of the Audi R8 V10 supercar. This level of power and performance is pretty much unheard of in a £50,000 sports car, and it’s unlikely you would ever start to tire of the staggering straight-line performance it offers. It sounds brilliant, too, especially with the optional sports exhaust emitting a raucous and hard-edged bark with every downchange on the seven-speed dual-clutch gearbox (no manual option is available). The mid-range torque is just as impressive as the power figure, with 354lb ft available throughout the rev range. It might not sing its way to the 6,250rpm redline quite like a naturally aspirated engine, but the muscular in-gear pace more than makes up for it. This would be a difficult car to stick to the speed limits in, but when you do, it’s actually no harder to drive than a normal TT. 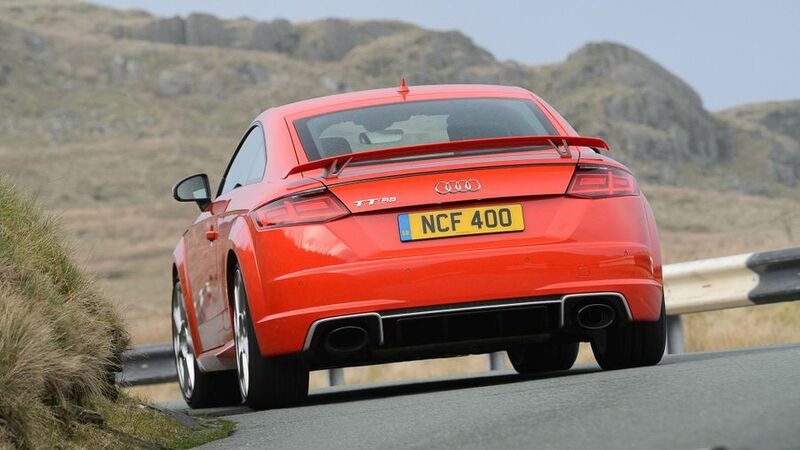 Naturally the TT RS is going to cost more to run than any other version of Audi’s stylish coupe. It’s also a little more expensive than its rivals, but does come better equipped as standard. Servicing, brakes, tyres and so on will all cost you more than less racy variants, but it’s not as bad as you might think. Considering the potent engine, CO2 emissions of 187g/km are surprisingly good, making the TT RS cleaner than many similarly high-performance machines. The four-cylinder Porsche 718 Cayman S is marginally cleaner and returns slightly better MPG in official tests, but in the real world, fuel economy will be pretty much neck-and-neck. A combined official economy of 34.4mpg is not too bad either, but you’ll have to be restrained to avoid fuel-sapping bursts of acceleration. Expect servicing to be pricey, as Audi dealers rank among the most expensive for parts and labour, and insurance is in the highest group available. Despite excellent perceived quality, and many years’ experience building this type of engine that stretches back to its rallying roots, according to Warranty Direct’s Reliability Index, Audi’s reputation isn’t an enviable one. The brand languishes near the bottom of the manufacturer standings, and the previous TT wasn’t one of the company’s better performers, either. However, other reliability surveys place the brand, and the TT, rather higher, and most of the engines and parts are used in countless other Volkswagen Group models. The RS sells in much smaller numbers than the standard car, but bar the engine, many of the parts are shared, so there shouldn’t be any nasty surprises. Service intervals are annual, and it has the same three-year/60,000-mile warranty as the standard model. Apart from Lane Assist, which helps steer the car back on course if you start to wander out of lane, the RS comes with exactly the same safety kit as standard. Traction and stability control is provided, as are four airbags. It’s not a particularly impressive specification, but it’s pretty much par for the course in this class. Still, it’s odd that basic kit like tyre pressure monitors, hill-hold assist, and a reversing camera (often standard in cars a fifth of the price) are not included, despite this being the most expensive TT you can buy. In Euro NCAP crash tests, the TT received just a four-star rating, partly because the tests are now tougher, and also because Audi does not offer automatic emergency braking on every model. Even so, it did do well for both adult and pedestrian protection, scoring 81% and 82%, respectively. The standard kit list is similar to the safety roster; generous in some areas, but with some key omissions that you would expect to be there, considering the price. Climate control, LED headlights, heated leather seats, sat-nav, Bluetooth, a decent sound system, plus the sportier styling elements are all included. Things you might want to add from the extensive options list include, but are not limited to: carbon fibre dash inserts (you can also get a rather cool, if slightly pointless, carbon engine cover), a sports exhaust, electrically adjustable seats, and a high-end Bang & Olufsen stereo. The option packs look like better value, as they bundle several bits of key equipment together. The Comfort and Sound pack adds the aforementioned hi-fi, electric memory seats, dimming door mirrors, and an advanced key fob. The Dynamic pack, meanwhile, adds the trick dampers and Sports exhaust, and in our opinion, should be the first box you tick. 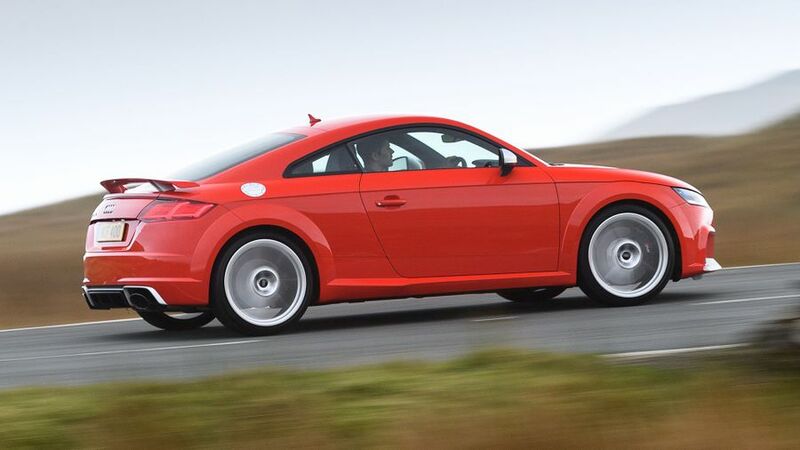 With its looks and headline-grabbing performance figures, the Audi TT RS is a very desirable car. As such, it fully deserves to sell to anyone wanting a very cool and rapid set of wheels. Drivers with an appreciation of pin-sharp handling might want to look elsewhere, though.